Amiq is our youngest member of the pack. She is an active, happy, funny, very loving and and a real outgoïng kind of girl. She is also a special 'working girl' as she is acompagning Rob and his colleges at Biemans Sport. Her very best friend over there is Inge de Wit. Inge and John are her co-owners. 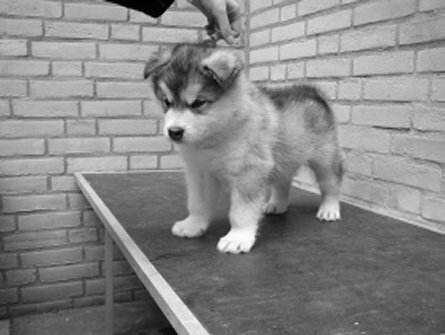 This lovely boy is chosen to be the new compagnion of "Ice" a wunderfull female bred by Mr. Del Biago. She lost her red Malamute compagnion Shadow recently and is very hapy the family of Nicola Foccardi are Wakan's new proud owners! He's ment to be shown and for future breeding. He is a sable pup like his mother and grandfather Multi Ch. 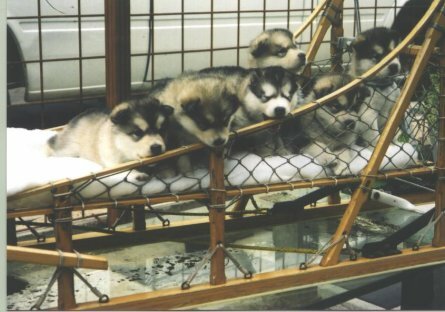 Yupik's Gizmo on which we used a red band to distinguis him. So maybe not only his wunderfull caracter and conformation was the reason they fell for him! 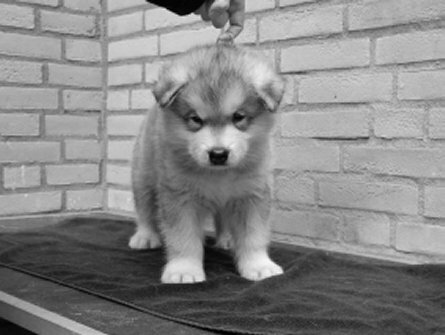 Here we have a real happy puppy always looking for something to do, especially together with the family Verstraeten. Although he is easilly distracted with something new and exiting he is very intelligent when it's for his own bennifit! 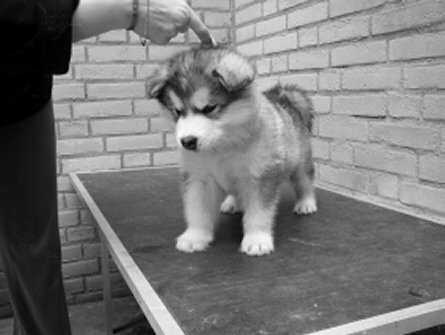 Play with his coöperatif instincts wisely and he is the ideal friend for obedience and work! A very handsome boy who likes to be on the easy side of the road. He takes his time to find out what's happening and than decides what to do. 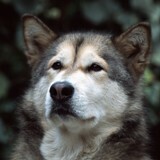 He allready has the dignity and pride the Alaskan Malamute is famous for. His new owners Ingrid and Marcel v/d Vorst are bound to show him! 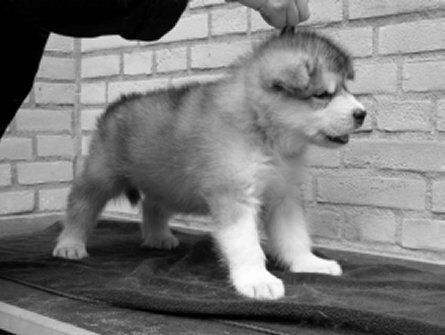 Willful and stirdy are the words that come to mind when we look at this puppy having a wunderfull time in the pack. He knows what he wants and keeps on doïng it until he succeeds. 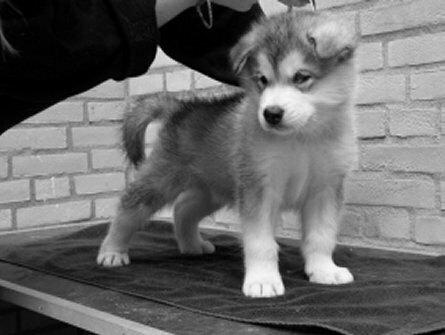 His new owners Francesco and Danielle Cardenas have to win his heart to open his mind and he will show them the world of a true Malamute! This is a real male with his own will and sets his goals firmly. He is having a wunderfull time minding his own buissnes though playfull on invitation. What a sweet face and loving looks! 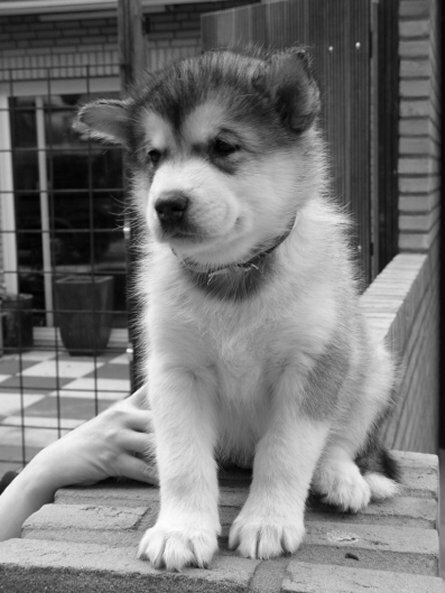 He'll bribe you without you noticing and do exactly as he pleases as a real Malamute is known to do! Consequence, intelligence and patience are the roads to be taken for his owners Jos and Thea v/d Ende to measure up his dog!